Intermec Inc., a workflow performance company that designs and manufactures leading data capture and information management solutions, has announced the availability of CK3 Next Generation Series of rugged mobile computers. Intermec Inc., a workflow performance company that designs and manufactures leading data capture and information management solutions, has announced the availability of CK3 Next Generation Series of rugged mobile computers, offering one of the industry’s highest performing mobile computing options to date. For use in distribution centers, manufacturing and retail operations, the CK3 Next Generation Series is comprised of two models – the CK3X and CK3R – which utilize a 1GHZ OMAP architecture to optimize workforce performance through industry-leading battery life, enhanced barcode scanning, superior device health monitoring and broad compliance for emerging industry standards such as HTML5. The CK3X is optimized for warehouse operations and is the perfect migration option from the current CK3B, while the CK3R is optimized for light industrial and retail front of store applications. Maintaining the current CK3B form factor and rugged design, legacy applications and backwards-compatible accessories allows customers to seamlessly migrate to the latest technology without an additional investment in chargers, docking stations or scan handles. The CK3 Next Generation Series is an exceptional choice for customers who need to support ever-changing data capture requirements and future-proof supply chain, DCs and in-store retail operations. The CK3X offers the ideal migration model for the current CK3B. Featuring the choice of integrated area imagers for standard range or near/far range scanning, the CK3X provides unsurpassed scanning performance on 1D and 2D bar codes including the ability to read poor quality or damaged codes. The scan engines also offer support for omni-directional scanning and high motion tolerance for improved efficiency. To truly future proof investments, the CK3X features a highly adaptable design supported by the latest RF standards – 802.11 a/b/g/n and Bluetooth radio, as well as an optional RFID reader accessory. The CK3X is a truly rugged mobile computer and is designed to withstand multiple five-foot (1.5 meter) drops to concrete across all operating temperatures. It also delivers industry-leading battery life performance, lasting through a full shift and beyond without requiring workers to replace or recharge batteries. The sleek form factor also comes free of the heavy bulk contained by traditional rugged devices in the same class. The CK3R contains the perfect mix of functionality and value for light industrial and retail environments. The CK3R’s slightly smaller size offers an even lighter, more ergonomic form factor perfect for front of store retail applications and also contains the newly introduced EA31 imaging engine for quick and accurate scanning operations and support for omni-directional scanning of 1D and 2D barcodes. Additionally, the CK3R is designed to stand up to the rigors of everyday use with a rugged, laser-etched keypad, a four-foot (1.2 meter) drop rating to concrete across all operating temperatures and an IP54 seal rating against rain, moisture and dust. 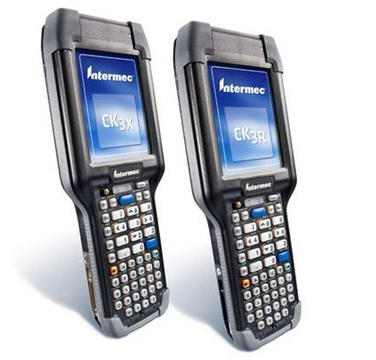 Both the CK3X and CK3R make transitioning from other mobile computers easy with device configuration tools like CloneNGo – Intermec’s breakthrough device provisioning – which makes it easy to “clone” device settings from a single master unit to an unlimited number of devices. Additionally, with the latest Microsoft Windows Embedded Handheld operating system, the CK3X and CK3R are compatible with a wide range of software applications – from warehouse management systems to other mission-critical tools developed by the Intermec PartnerNet Independent Service Provider (ISV) community. Intermec automated data capture solutions are distributed in the Philippines by MSI-ECS Phils. Inc. For complete product specs and availability, please contact MSI-ECS Phils, Inc. at (+632) 688-3180 or email aferreras@msi-ecs.com.ph.